Picture (REQUIRED) 3 Max! Please limit picture(s) size to 1024 x 768. Open to all Super Hawk Forum Members. You are limited to 1 entry per month. You can only nominate your own VTR. (projects, daily riders) Candidates will be nominated up until the 15th of the month or when 15 nominees have been made, whichever comes first. A poll will then be set up (on the 16th if less than 15 nominees) for everyone to vote for VTROTM for that month and close on the last day of the month. All participants who vote will get to vote only once per month so make it count! Negative comments, criticism, harassment, and all around bad manner wont be tolerated. 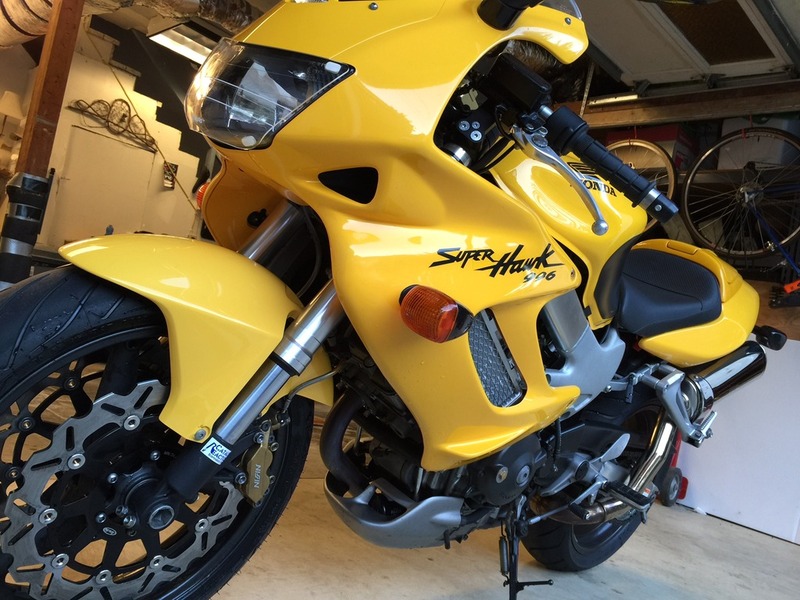 If you have won VTR of the month, you cannot enter your bike for 12 months. In the event of a tie, a 7 day poll will be set up to break the tie. Rules subject to change / amendment at any time. 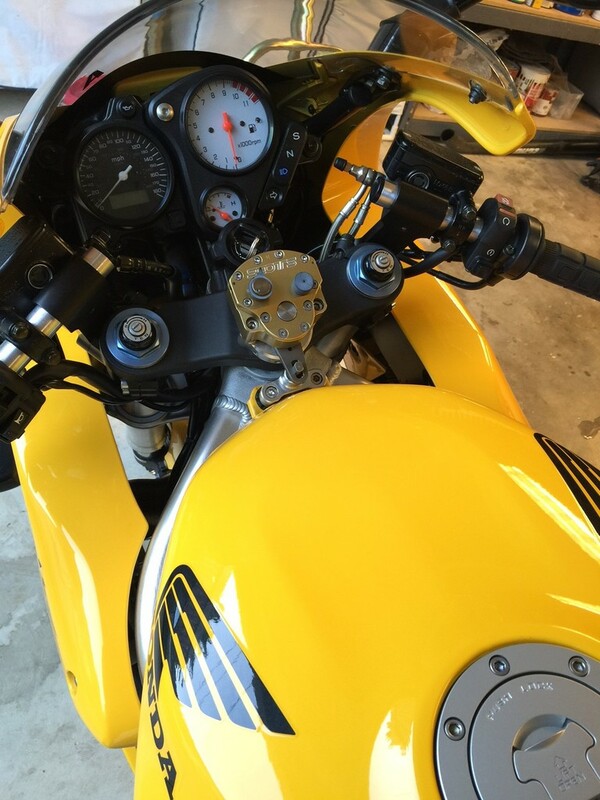 Description of a candidates bike should include the following If available: owners name year color(s) modifications All you members that have said that have been waiting to enter, now is your time. Rat bikes are more than welcome as are garage queen perfect stockers, and of course the bikes that you have spent a stupid amount of time and money on. What we're after here is serious Super Hawk ****. Where are all the much anticipated bikes? Not being a down'er, but this is one of the ten warning signs of a dying forum. Unfortunately I have to agree with what you are saying. Of late there are a few high profile members with some nice rides that are missing. Come on guys, you know who you are. Post your bikes please and get this show on the road! It's not finished, but are they ever? Oh, and it's a '99. The red '98 is gone. I flipped that bird. Last edited by Hangfly; 10-23-2015 at 07:15 AM. Looks good hangfly. You've got my vote so far. What master cylinders are you running for brake & clutch? Thank you for your vote. The competition is fierce. I just snapped a few photos with my phone last night and posted them. I wanted to get a good lens find a neat pumpkin patch for a fancy photo. But that would likely never happen, so above is the environment it waits in between rides. Those M/Cs are from a Honda CBR600 of some sort. Sorry I don't have specifics. The brakes are ok, but have a bit of play even with everything bled out really well. I may change the brake M/C. Am seeing how Matt does with his. Unlike me, you probably use your VTR. I bought this from an older guy who had it under a cover since new. It has about 4,300 miles on it. He did dump it once however. The skin was replaced and everything fixed up nice. He then added the Scotts since he claimed a head shake was partly to blame for the mishap. I have since installed tapered AllsBalls so I am not sure the Scotts is even needed. What do you think? Last edited by Hangfly; 10-23-2015 at 08:57 PM. I think the Scott's is cool, but makes lifting the tank more of a hassle. I personally would sell it and use the money on something the bike really needs. I've never even heard of a Superhawk having a headshake problem... Not that it's not possible, just not probable... Though we don't know your exact setup with the usd forks and rear shock. If ya don't need the money, keep it because it is cool. With the USD forks it is possible, but for that you need 130+ hp at the rear wheel like Tweety's bike and even than, he said it is not really necessary, so yea, i have a USD from CBR1000RR and it doe's feel much lighter, but never had head shake and I'm pushing all the time. Like thedeatons said, I would sell it for a better mod. Just fooling, I could use the Scots out here down under as the VTR gets a bit light in the front end at 220 K in 5Th with the standard reworked and braced front end. The roads here are pretty bad compared to other countries but there are a few gems close to where I live. You have a nice looking bike there! Very clean indeed. Thanks for posting. What a nice bike, shame there weren't a few others. Thanks for posting mate, well done. Yea that bike is super clean... "**** thats fresh..."
Yes Scottieman. shame on you for being awol. I recently purchased the yellow Corbin Smuggler from a forum member. It weighs about as much as the rest of the motorcycle but is really comfy. Plus it has a nifty little glove compartment built in. 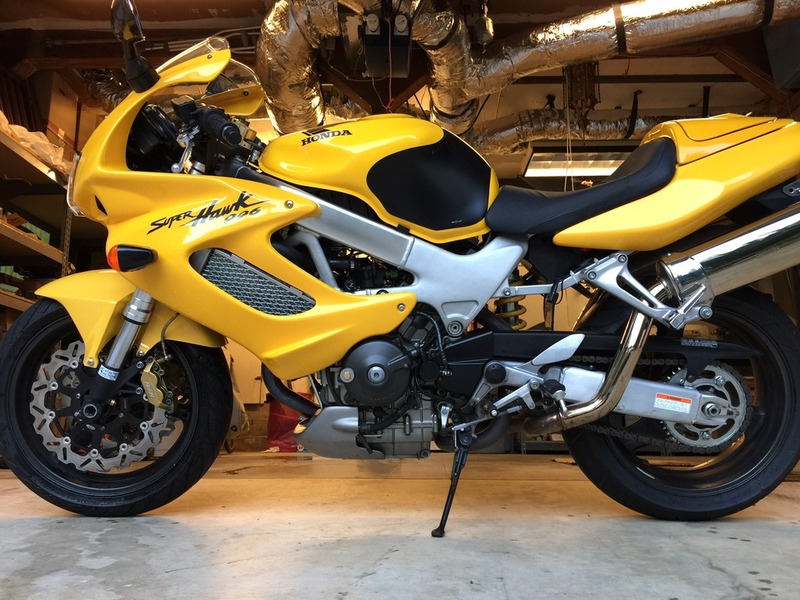 I had collected the front end parts (954RR) with the intent of converting my last VTR, but bought this yellow example (and converted it) since it had nice exhaust was so clean. And yellow is everyone's favorite color anyway. I gave a local bodyshop the original fender and the red 954RR fender and told him to do his best. Dang if he didn't nail the color! It is a 3 part process with metalflake involved and he got it VERY close to perfect. The front turned out really nice and I love it so far. But the forks have .95 springs which are a little too "racy" for me. Need to do something about that eventually. The shop that did the work on the forks said I could bring them back for spring changes at no cost if needed. But thank you.